The Shozam Web gallery generator automatically creates full-featured Web galleries, allowing photographers to display and sell their work online. “I’ve created Shozam galleries with hundreds of images in under 10 minutes, start to finish. And the results are top notch. We recommend Shozam to our customers, and include it as part of our complete photographic and digital service offering.” said Brooks Clayton, President of Mid South Color, Jackson, TN. The Shozam Business Edition, available now, retails for $299.95, with a special introductory promotion of 35 percent off if purchased by June 8, 2007. The Shozam Lite Edition is free. A free trial version is also available. 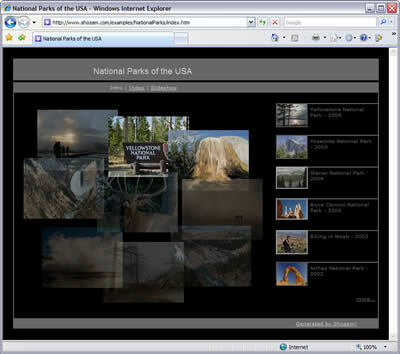 BELLEVUE, WA, May 24, 2007 – KOMOTION, Inc., the makers of the popular, award-winning Web Gallery Wizard™, today announced Shozam™ Web gallery generator which automatically creates full-featured Web galleries to showcase digital media. Designed for professional photographers, photo enthusiasts and artists to display and sell their work online, Shozam is the only product on the market today that provides advanced features and flexibility in an easy-to-use package, allowing users to truly own and monetize their content. A software tool, not a Web service, Shozam galleries are “portable” among PCs, Web hosts and social networks. This flexibility provides offline immediacy and impact. Galleries – complete with slideshow and background music – can be created and updated offline, moved easily from Web host to Web host, or even burned to CD and shared with clients on the spot. To extend online presence on photo-blogs and social networks, Shozam widgets provide an eye-catching, sticky method for grabbing attention. Shozam removes dependency on online photo sites, eliminating commissions and reducing third-party fees. For those who want control, not “community,” Shozam users make their own business decisions and use vendors they choose. They control image compression and protection, the look and feel of the gallery and where it is hosted. Users monetize images, videos and galleries with integrated PayPal and Google AdSense™ for online advertising by simply filling in a few fields, and Shozam does the rest. Users can get their own high-end results at a fraction of the time and cost of using a Web designer. Galleries with thousands of images can be designed and generated in minutes, not months. Gallery themes feature a Flash animated intro, standard static HTML code, and can be further personalized with the built-in Theme Editor. The Shozam Business Edition, available now, retails for $299.95, with a special introductory promotion of 35 percent off if purchased by June 8, 2007. The Shozam Lite Edition is free. Other editions with different feature levels and price points will be available soon. A free trial version is also available. Shozam runs on Microsoft Windows®. For more, go to: www.shozam.com. Established in 1997, Komotion provides products and services that help businesses and consumers showcase their digital media online. The Company is located in Bellevue, WA. For more information, visit: www.komotion.com.